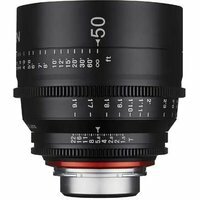 The 50mm T1.5 Cine lens joins the new XEEN range of professional video cinema lenses from Samyang. The main characteristics of XEEN lenses are their outstanding resolving power, which is suitable for high-definition videos. In addition, the XEEN lenses feature Multi-Nano-Coatings ensuring maximum image quality by minimising lens flare and ghosting. XEEN lenses reliably deliver high quality footage with clear contrast and impressive colours, even under less-than-optimal lighting conditions. The large T1.5 aperture also creates a pleasing bokeh effect for a cinematic look.